This article is about the Admiralty Island in Alaska. For the Admiralty Islands of Papua New Guinea, see Admiralty Islands. For other uses, see Admiralty Island (disambiguation). Admiralty Island is an island in the Alexander Archipelago in Southeast Alaska, at 57°44′N 134°20′W﻿ / ﻿57.733°N 134.333°W﻿ / 57.733; -134.333. It is 145 km (90 mi) long and 56 km (35 mi) wide with an area of 4,264.1 km2 (1,646.4 sq mi), making it the seventh largest island in the United States and the 132nd largest island in the world. It is one of the ABC islands of Alaska. The island is nearly cut in two by the Seymour Canal; to its east is the long, narrow Glass Peninsula. Most of Admiralty Island—more than 955,000 acres (3,860 km2)—is occupied by the Admiralty Island National Monument - a federally protected wilderness area administered by the Tongass National Forest. The Kootznoowoo Wilderness encompasses vast stands of old growth temperate rainforest. These forests provide some of the best habitat available to species such as brown bears, bald eagles, and Sitka black-tailed deer. The island was named by George Vancouver in honor of his Royal Navy employers, the Admiralty. Joseph Whidbey, master of the Discovery during Vancouver's 1791-95 expedition, explored it in July–August 1794, in the process circumnavigating it. Known to the Tlingit as Xootsnoowú, which is commonly interpreted as "Fortress of the Bear(s)", Admiralty Island is home to the highest density of brown bears in North America. An estimated 1,600 brown bears inhabit the island, outnumbering Admiralty's human residents nearly three to one. 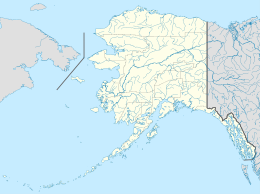 Angoon, a traditional Tlingit community home to 572 people, is the only settlement on the island, although an unpopulated section of the city of Juneau comprises 264.68 km2 (102.19 sq mi) (6.2 percent) of the island's land area near its northern end. The island's total population at the 2000 census was 650. Murder Cove is located at the southernmost portion of the island and was home to the Tyee Company whaling station. The Greens Creek mine is an underground silver, gold, zinc and lead mine located on the northwest end of the island, within the national monument. It began operations in 1989. Admiralty Island offers opportunities for outdoor recreation. The U.S. Forest Service maintains several public-use cabins on the island, as well as the Cross Admiralty Canoe Route, which links the island's lakes through a series of portages. The Pack Creek Brown Bear Viewing Area offers visitors the opportunity to observe brown bears in their natural habitat as they fish for salmon and interact with one another during the summer months. Permits are required for all visitors to Pack Creek; they can be obtained through the Forest Service. The Point Retreat Light is located on the northern tip of Admiralty and was an important aid-to-navigation. ^ Vancouver, George, and John Vancouver (1801). A voyage of discovery to the North Pacific ocean, and round the world. I–VI. London: J. Stockdale. 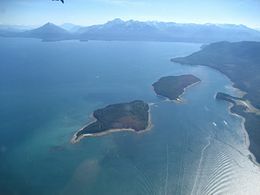 Wikimedia Commons has media related to Admiralty Island, Alaska. "Admiralty Island" . New International Encyclopedia. 1905.